The consolidation of all the processes on common rules in a single system. Timely reporting about all the processes inside the company. Planning and monitoring of the organization’s activities. Along with these advantages, ERP implementation improves the company’s productivity and compatibility. Due to its modularity, ERP software can be implemented gradually, for example, you can start with a workflow automation and then proceed to manage human resources. Below is a comprehensive list containing 14 benefits of ERP systems. Each enterprise-level software has its own characteristics and peculiarities. Here, we focus on primary business advantages that a typical ERP can give to your company. 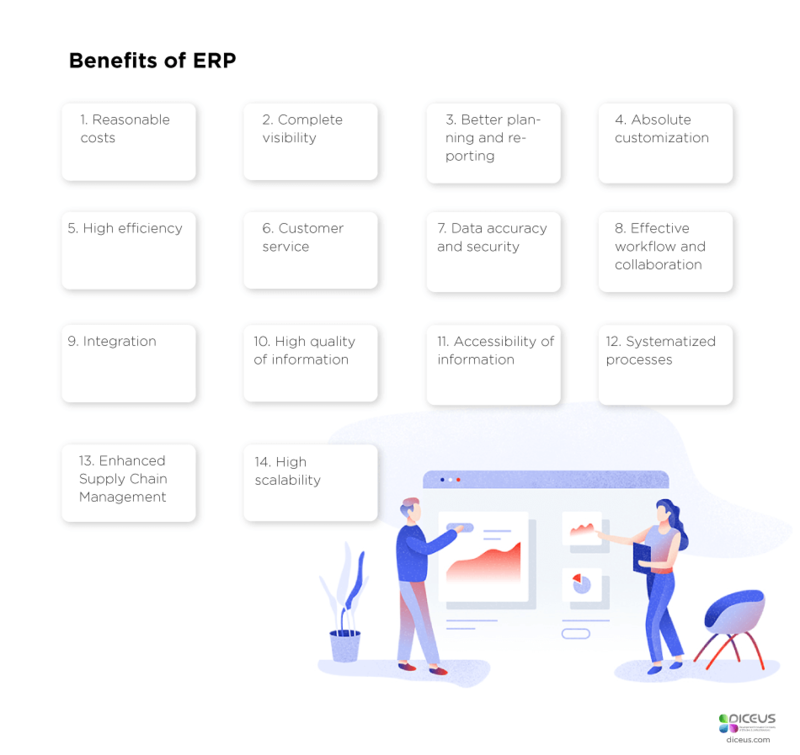 One of the frequent reasons why companies decide to implement ERP systems is decrease technology costs, enhance labor capacity and effectiveness at the workplace. By launching a unified platform for planning enterprise resources, business owners are able to cut costs for IT-related activities and staff. A unified system can work best in large corporations and enterprises because its end-users have to learn how to use it once without the need to master a bunch of individual apps. Today, ERP applications may include the functionalities for managing customers relations (CRM), finance, accounting, supply chains, and human resources as well as numerous other activities. Every single employee, in their turn, uses only those features and options which face their needs. You might be interested in the following article: “Enterprise Software Vs. SaaS: Choose the Right Solution with a Free Checklist”. By implementing ERP systems, senior managerial staff and CEOs are able to make all processes and operations visible and accessible. For instance, they are able to track inventory including future shipments. By controlling your inventory, you are able to manage your budgets more effectively and stick to your economic strategy. The accessibility of all necessary data in one place improves the collaboration between different departments. People are able to track what is needed to be done, what is in progress, and what is already completed. The workflow is streamlined and coherent. This advantage of ERP allows to make data-driven decisions and explain to others what logic stands behind those decisions. As mentioned above, by implementing ERP you get a unified system. This system will surely be able to form accurate reports and provide useful analytics. Therefore, you will avoid dealing with a stack of papers. ERP in accounting generates income and cash flow reports in a single system at any time, for example. Some systems provide in-built business intelligence functionalities which allow getting a more analytical insight into business operations. These insights facilitate data-driven decisions. A considerable benefit of ERP systems is its modularity. The larger part of the existing ERP software offers different modules applicable to your business goals and needs. Each component can exist like a stand-alone application or can be integrated with the other modules. What is also important is how the system is realized. There are two popular types of ERP systems: on-premise and cloud applications. If you choose an on-premise software, you buy a physical suite and install it on all servers and computers in the company. A cloud software is hosted off-site. Time and efforts committed to a project as well as the costs can be reduced with a successful ERP implementation. Usually, enterprise resource planning software helps eliminate routine and repetitive activities within an organization. Therefore, teams can have more time to focus on important tasks that affect the revenue. Is it only your personnel who receives benefits from ERP launch? What about your customers? Do they feel any advantages when your company starts using a new system? They probably won’t know that you implemented a new way of resources planning but they will surely notice that. Your customers' information is stored in a unified system, your sales reps and teams are able to make customer relationships processes more streamlined. With a properly set up ERP system, you are able to focus on customers retention and acquisition more than ever before, analyze your marketing efforts and craft new strategies based on analytics and reports. ERP for retail usually supports e-commerce integration with other modules, handles orders processing, and customers interaction so that your business is run better. The core of any enterprise system is data. While departments collaborate with each other, they share a lot of information. With a properly designed ERP system, business owners and senior management staff are able to control who has access to that data. A unified system ensures data security whereas multiple systems can cause conflicts between sources. All types of ERP software (cloud and on-premise) can bring your company’s data security to a new level. On-premise software backups your sensitive information whereas cloud services provide additional layers of security and involve experts to protect their servers 24/7. Enterprise resource planning systems allow teams to collaborate effectively. With a well-structured ERP, company’s information is regularly updated and employees get the needed information in real time. Improved communication and effective collaboration increase the efficiency of the entire organization and reduce costs related to manual activities. Surely, when everything is automated, the quality of information improves. People are making fewer mistakes and don’t omit the things they omitted when they had to perform most of the tasks manually. Human input is frequently associated with most errors that occur. ERP ensures the reliability of the information as such systems eliminate human inputs. To run any business efficiently, you must be sure that you have the tools that ensure data accessibility and control. It is important for the employees to access the information they need at any time. However, it is equally crucial to prevent some users from breaching the sensitive data. ERP solutions provide advanced control of confidential data. A larger part of enterprise-grade IT solutions is developed in accordance with the existing workflow and with a glance to those processes that are to be enhanced and standardized. In the case of custom-designed ERPs, a company receives a product that is aligned with the existing company’s workflow and completely meets the requirements of all users. Organizations that handle production and inventory, are in need of highly effective ERP system which can cut the time for deliveries and leads. With a properly set up software, your supply chain can become more responsive due to enhanced inventory management, demand forecasting, procurement, etc. Besides, an ERP is able to considerably increase profitability and decrease overages involving inventory and production. A single vision of sales, manufacturing/production, and delivery time allows optimizing stock rather than relying on “best guess” estimates for upcoming volumes. Any business if successful is expected to grow. You should look at the future to plan and craft your strategies properly. Having a robust system in place that can efficiently accommodate your company’s growth is of the utmost importance. A scalable system will help you expand your customers base, enter new markets, or roll out innovative processes. So now when you know the key benefits of the ERP system, let’s proceed to find out what features you may need for a certain type of system. What Are the Main Features of an ERP for Retail? Multichannel. Today’s fast-paced world requires retailers to use several channels for promoting and selling their products and services. A good ERP for retail should take this specificity into account and provide its users with a functionality to track all the channels. Integration. To figure out how consumers prefer to interact with your company and brand, to understand their buying habits, you should have a robust CRM. Most ERPs offer an inbuilt CRM module. In case you develop a custom ERP for retail, think about a user-friendly CRM for your system. Warehouse management. It’s crucial to choose a good ERP system offering warehouse management module. For instance, when your inventory is updated, the changes should be reflected in all of the sales channels. Point of sales. POS should be also integrated with your ERP. POS modules should supply employees with useful customer information, purchase history, and products availability. Accounting. A lot of systems require users to do accounting in separate systems, for example in QuickBooks or Sage. Unfortunately, in this case, your records cannot be accessed in real time. That’s why it’s better to have integrated accounting in your ERP system. Read “How Is CRM Development Effective? Algorithms of Carrying Out the Projects”. What Are the Main Characteristics of an ERP System in Accounting? Business Intelligence. Tools like predictive analytics provide patterns and insights within the available data. You can use BI tools to manage future cash flow and detect accounting issues in audits. Therefore, with BI tools predicting future cash flows, your company is able to plan marketing campaigns and craft sales strategies. Processes Automation. A lot of general accounting and bookkeeping tasks can be automated. The automation of all processes reduces routine and repetitive tasks, helps accounting departments process large scopes of data. Third-Party Integration. Enterprise-grade apps offer integration with specialized software for completing a certain number of tasks. Your employees will no longer have to spend time for manually transferring data between different systems. Multi-Currency. A lot of companies wish to enter new markets and spread out in other countries but, unfortunately, their systems cannot handle multiple currencies. This leads to errors in changing conversion rates. Multi-currency functionality supports a great number of currencies, real-time conversion rates. Bank Reconciliation. This feature is crucial in accounting as it shows payments and invoices entered by different departments. For people-centric organizations, it’s important to provide the services of high quality. When choosing a system, service industry companies pay attention to such aspects as managing expenses and time, project management, performance, and other things that help increase productivity. Here every transaction should be recorded accurately in the system, all processes should be interconnected to eliminate errors and delays. Why Should You Use ERP? We enumerated 14 benefits of ERP implementation in our article. So no when you know why you might need an ERP great system let’s form a checklist for selecting the software that fits your requirements and business needs. How many user licences does your company need? Should the app be designed to work with different RDBM systems, for example, with Oracle? Does a system of your choosing offer integration possibilities? How you will address the data warehousing aspects? What should the max. time for uploading the remote data be? What should the min. time for uploading the remote data be? Will the software support distributed data processing? Will the software support parallel data processing? Did your vendor have some problems with concurrency in the past? Does the software offer an audit trail on key transactions? What is the security level of the software? Which networking protocols does the system support? What data types does the app support? What is the smallest database the vendor handled? What is the biggest database the vendor handled? Does a system you chose offer the reduction of time for the processes you are interested in? What is the max. processing time for material resources planning? What is the min. processing time for material resources planning? Will the processes be optimized after the system implementation? Has your vendor ever implemented the system in your country? Has the vendor implemented the system in your industry sector/domain? What are the schedules for the delivery of the system? Did the vendor introduce you the implementation plan? How long did it take the vendor to launch the similar system for another company? How many years of experience does your vendor have with ERP development and implementation? Does the vendor have a devoted development team? What do other customers say about the vendor? What kind of hardware support does your vendor offer? Does the vendor have the partners to support the hardware? How does the vendor plan to support the software? How many modules will the software have? What operating systems will the system support? Will the system support multilingual operations? Will the accounting module support multicurrency? Will the vendor provide support and maintenance after the system’s launch? If you vendor is offsite, will they be able to support the system remotely? How much time will it take to train the end users to use the system? Which UI/UX solutions did your vendor offer? Will your system be customized? This list is incomplete. Yet, it has the basic questions to check if you vendor has enough experience and a team with required skills to accomplish your project. Note that you should conduct an in-depth research before choosing any software development vendor not to be deceived or misinterpreted. In case you have any doubts about your ERP project, feel free to contact our experts. There are cases when a company already uses a certain ERP system but employees are not satisfied with the options and features this system offers. Therefore, you must know and understand how to identify when it’s time to replace a legacy or ineffective software. Your system lacks agility. Enterprise assets planning solutions must be adaptable enough and offer the possibilities to work with other apps. It’s time to consider a new system if the existing one prevents you from expanding into new regions or meeting specific regulations. The existing software is not mobile-friendly and doesn’t provide the required data in real time. Updated information is critical for data-driven decisions. If your software lacks BI tools which can help you analyze and interpret data, consider a new system. It is also recommended to switch to another system in case your employees are not able to access business data from anywhere and at any time. Your system doesn’t provide integration options. Enterprise-level technological innovations are coming into our lives every day. To implement innovations, a company must control the changes and implement them relentlessly. In case your software doesn’t integrate the up-to-date technology, invest in the development of a custom ERP. These were the main signs demonstrating that it’s time to consider the replacement of your ERP system. You also read about the main pros of ERP solutions as well as the characteristics of this software for several types of industry. If you liked our article, share your opinion or experience related to this topic. Our readers will be glad to discuss other aspects and questions. Follow us to stay tuned.